Computer users should keep an eye on the health status of their hard drives regularly, to avoid hard drive crashes or data loss. 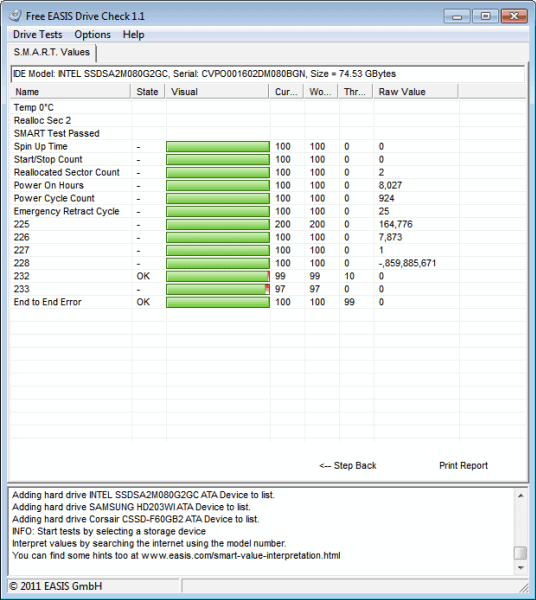 Diagnostic tools like Easis Drive Check aid the user in determining a hard drive's health. The information gained by the diagnosis can then be used to determine necessary precautions, for instance more frequent backups or the replacement of the drive with a newer model. The hard drive diagnostic software is free to use. It offers two tests which become available on program startup. The SMART test retrieves a drive's SMART values which reveal many information about a drive's health and status. This includes the temperature, number of power cycles, power on hours or error count. The values are presented to the user in the interface, but they are not interpreted or explained by the application. Users without the proper know how may have troubles understanding at least some of the values listed. The second option is for drives that do not report SMART values. This may include storage devices such as external hard drives or other USB drives. The sector scan basically performs a read test on all sectors of the drive. Read errors can be the first sign of a failing hard drive. This test can take a long time, depending on the size and speed of the drive. A test on a 2 Terabyte drive with a speed of 5400 rpm for instance took 5 hours to complete. Smaller or faster devices should test considerably faster. One interesting option is the ability to configure email reports. This basically sends a report to an email address whenever a test is run in the application. It is necessary to enter not only the recipients email address but also the SMTP host, username and password. An option to schedule regular scans is missing unfortunately. Windows users who are interested in Easis Drive Check can download the program from the developer website. The program is compatible with 32-bit and 64-bit editions of the Windows operating system.